How can Twitter serve the arts? Twitter is one of the most popular social networks with 271 million active users worldwide. While the updates are limited to 140 characters, most include a link to a larger blogpost. Hashtags help other users to find relevant content and to connect with people who share their interests. How can this be useful for artists, art institutions or galleries? Happy Wall is a project by artist Thomas Dambo. 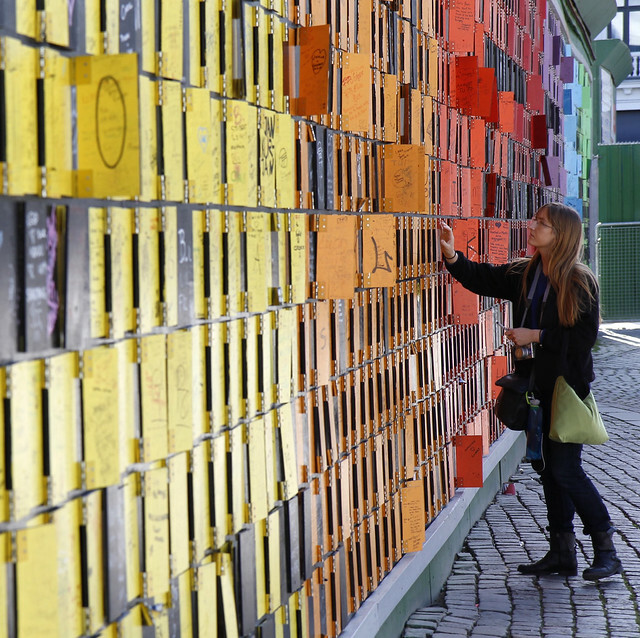 He created an interactive wall out of the remnants of Tuborg’s cinema tribune at Roskilde Festival 2013. The wall consists of nearly 2000 wooden boards right in the middle of Copenhagen. The boards can be reversed to show another color. People can create their own works of art by redesigning the boards to different patterns, words and figures. 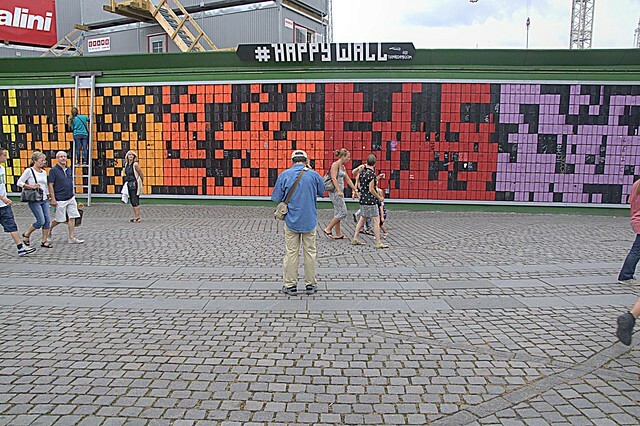 The participants are requested to take photos of their work and to publish them on Twitter or Instagram with the Hashtag #happywall. I watched people having a lot of fun creating, posting and watching this interactive ‘creative game’ every day. contemporary, creativity, happiness, working and creating our world together, openness, fun, connection with the world, everyone can be an active part of society, recycling, awareness of potential, positive energy by rebuilding after destruction, ecology, future. Thank you for making my day in Copenhagen, Thomas Dambo!